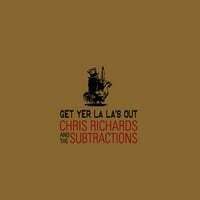 Detroit power pop trio Chris Richards and the Subtractions will release their latest full-length Get Yer La La’s Out on Gangplank Records on May 29th. Produced by Gangplank-founder David Feeny at his own Tempermill Studios just outside of Detroit, the album contains 10 songs of hook-laden, melody-intensive pop confection (The vinyl version of La La’s will feature an additional track- a cover of Dogs by the Who and will be released in mid June). In addition to singer/songwriter Chris Richards, the Subtractions feature a powerful rhythm section in bass player Todd Holmes and drummer Larry Grodsky who have been fixtures on the Detroit scene since their time in 80’s and 90’s outfits Hippodrome and The Pantookas. Richards’ love of power pop, which combines an affection for the music of the British Invasion along with 90’s bands such as Teenage Fanclub and The Velvet Crush, is reflected in their guitar-driven approach. The Subtractions last record, Sad Sounds of the Summer, received glowing reviews from The All Music Guide and a sundry of Power Pop leaning publications as well as countless “Best Of” lists in 2009- including - David Bash Best of 2009 List, John Borack’s Best of 2009, #3 on the overall Best of the Year Audities List, Beat the Indie Drum-Essential Albums of 2009, Not Lame/Bruce Brodeen- Best of 2009, Pop Chef (Spain), Power Pop Station (Brazil), Power Pop Review (UK), Absolute Power Pop and Power Popaholic. Richards’ 2004 Mystery Spot was voted as one of the “Best of the Decade” by Power Pop Action (Spain). The recording of Get Yer La La’s Out took place over multiple sessions in late 2011 at Detroit’s Tempermill Studios, produced and mixed by Tempermill owner and multi-instrumentalist David Feeny (Blanche, American Mars).